Home » Blog » New IIMs vs the Best non IIMs – What to Choose? 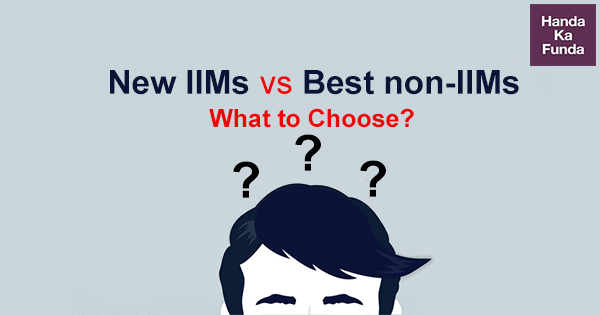 New IIMs vs the Best non IIMs – What to Choose? There was a time not too long back when there were only a handful of IIMs. As recently as 2008 saw the first batch commence at IIM-Shillong which became the 7th in line. Now at last count, there exist 20 of them. The general understanding is that the older IIMs are much better. This is due to several legacy issues, not least of them being an extremely rich and diversified alumni group. The new IIMs though are coming up, and slowly making their mark. While there is little doubt that the newer IIMs stand well below the older ones, especially ABC & L, a lot of students face the dilemma between choosing a new IIM or some other institute which is older and extremely prestigious. The final college selection decision is now months away, but students need to gear up accordingly from now. Most serious CAT 2018 aspirants have started giving mock exams, so they have an idea where they stand. This will help them gauge what kind of colleges’ forms must they fill depending on the percentile/score bracket they are finding themselves in. Let us here, look into the pros and cons of either decision. The IIM Brand counts for a lot in the long run. There was a time not long back that IIM-Indore was seen as a poor country cousin of ABC, but now it has established itself as a premier management education hub- at post-grad and under-grad levels. So, with time the newer IIMs, especially a few of them will naturally catch up. Some may take longer but factors such as location and a visionary leadership would see some reach the very top levels. Infrastructure is one area where few can compete with nationalized institutions, as these are set up under central government norms, and generally do not lack in funding of any sort. This not only refers to physical infrastructure but also to intellectual bits as the library and resource centres receive similar largesse. Needless to say, this also usually translates to an overall better lifestyle due to sports and outdoor facilities. One factor that cannot be ignored anymore ever since the passing of the IIM Bill is that IIMs provide an MBA Degree as opposed to the other standalone institutions that mainly dole out PGDMs or even a PGP. An Indian Institute of Management grad will always have the Bragging Rights when it comes to family and social occasions, that other brands will never have in the popular imagination. This could also backfire as those from newer IIMs could similarly be out-bragged by those from the older ones, especially ABC &L.
The new IIMs have a more even, democratic Geographic Spread. They are now found in most states of India and cut across regions. Smaller towns such as Rohtak, Ranchi, Udaipur, Kashipur, Bodh Gaya, Amritsar, Sambalpur, Sirmaur and Jammu now have IIMs. More are being planned. This is in stark contrast to the private space where institutes are concentrated in or around the big cities and education hubs of Delhi, Mumbai, Pune, Chennai and Bengaluru. The biggest advantage an old giant provides is a rich Alumni Network. Campus placements depend and future growth depend to a large extent on the influence the alumni has at the top corporates or even government/international bodies. This takes decades to build. Those from the newer IIMs are now barely toddlers in the bigger picture. It is true that the newer IIMs generally tend to have the better physical infra, these legacy institutions have a rich intellectual capital made of top-notch Faculty, many of them working for decades in management education. As far as the Degree advantage counts, it can be nullified by the fact that a PGDM approved by AICTE and AIU is for all practical purposes equivalent to an MBA. A PGP is more problematic, but MBA vs PGDM is merely nomenclatural. In addition, some of these non-IIMs such as FMS, UBS or JBIMS are part of universities, so naturally dole out MBAs. While bragging rights do provide short-term stimulus, in the end it is better to be known in the real circles where needed rather than mass adulation. Recruiters know the inside story so have a better view of the top non-IIMs as opposed to the newer IIMs. They have seen themselves or gauged intelligence from others in the industry on the feedback that students from any institute have received over the years. Due to the sheer advantage of years, some of the older ones such as XLRI, FMS and SPJIMR have developed an impeccable record of theirs, which the newer IIMs will take time to build. Sectoral Focus is one area where it is the non-IIMs who tend to have an advantage as the best ones are MICA, IIFM, IRMA, MANAGE, NIAM, ISM, TISS etc. So, for anyone looking at a niche career option, an umbrella MBA from a new IIM may not help directly. Super-specialization for engineers in particular is also available at NITIE and the IITs. So, it is not a straight-forward case of one better than the other, but a layered decision to be made. We at Handa-Ka-Funda (HKF) will suggest a closer look depending on the particular situation. A selection from XLRI, MDI, FMS, SPJIMR or JBIMS would be comfortably above all but the top few IIMs. For the next notch of institutes, one has to take a nuanced approach fitting one’s percentile against the college available. City preference may also at some point be a factor, depending on the candidate’s geographical location. At times, when the economy goes through a bleak period, placements get affected so, placing oneself near the biggest centres may be of help. No doubt a few institutes have seen their ranks lower in most national-level ratings. There has also been a migration of resources towards the IIMs especially when it comes to the intellectual capital of the Faculty. But end of the day, it is only good for the Indian management education scenario to have increased competition and more options for the students. It is best finance college with best ROI in india.